ATV Games Reviews - Great Deals on the Most Popular Games! ATV Games - The Best ATV Racing Video Games. I admit I like to play ATV games even at my advanced age. But I don't want to waste time on some of the clunker off road racing games out there. That's why we came up with this list of the best quad racing games - so you can start having fun as soon as you punch the ON button! MX vs ATV Untamed - (click to see our collection of the best ATV games videos.) This is still the most popular of the bike-atv motocross racing games. The MX vs ATV series has always been a favorite among real racers. Many say this is their go-to game when they can't ride the real thing. And I think that says a lot! Most Xbox game reviews agree. Good graphics - good physics - decent sound. Overall the most realistic of the Xbox 360 racing games. It's still a little "arcadey" in look and feel - but it's not supposed to be a full on racing sim. 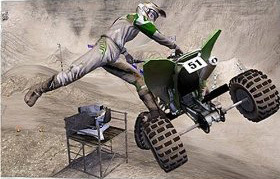 MX vs ATV Unleashed - This one is rated as one of the best of the PS2 racing games. It's an older release but just seems to play well on the PS2 game console. Graphics aren't quite as good on the PS2 video games as they are on the newer PS3 or even some of the Xbox video games. Unleashed was the clear winner among all the PS2 ATV games. It's one of those rare racing video games that kids and adults alike seem to enjoy equally. That fun factor is what keeps this quad ATV game near the top of everyone's favorites list. ATV Offroad Fury Pro - The clear winner for best of the ATV PSP games. Of all the ATV Offroad Fury PSP games, this one gets the nod. This version fixes the complaints with ATV Offroad Fury Blazin' Trails. Most think this version of the Offroad Fury franchise rivals the Playstation 2 games for "playability". Among all of the ATV - bike games, ATV Fury translates to the small screen better than the rest. If you want an Offroad ATV game for the PSP, this is the one to have. 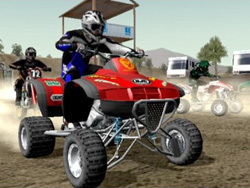 ATV Offroad Fury 4- The ATV Offroad Fury PS2 games are all more quad ATV oriented than most other series. If you love to concentrate on offroad ATV racing in your games - be sure to check this one out. ATV Offroad Fury 2 really got some attention when it came out. Good game play and a ton of adjust ability compared to other PS2 games. Then ATV Offroad Fury 3 seemed to take a step back and was panned by many gamers. It just wasn't worthy after expectations were raised with ATV Fury 2. Apparently Sony was listening and put things right again with Fury 4. Talk about adjust ability - you can even design your own tracks! Throw in great graphics and playability - excuse me - I've got an old PS2 to hook up! ATV Quad Power Racing 2 - A favorite with the Gameboy crowd. Graphics and playability were mentioned as some of the best features. I thinks it's more of a "video game" than a serious ATV racing game - but that's OK. If you have a Gameboy and like ATVs - go for it. If you want to shop for the best deals online, just use the link below.